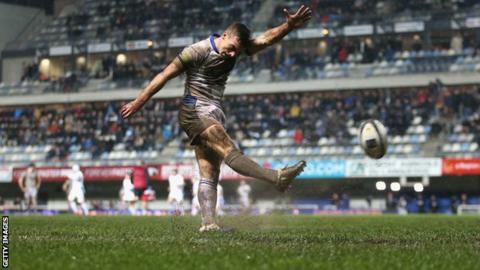 Bath kept their hopes of making the knockout stage of the European Champions Cup alive with a convincing victory away at Montpellier. Henry Thomas powered over for the visitors' first try in a match that saw England's George Ford kick 15 points. An ill-disciplined Montpellier, who had three players yellow carded, then conceded a penalty try soon afterwards. Leroy Houston scored a third Bath try, before a consolation from Alex Tulou, as Sam Burgess made his European debut. Burgess, who has crossed codes from rugby league, made his first union appearance as a second-half substitute in Bath's 25-6 Premiership victory over Harlequins last weekend and came on here as a 53rd-minute replacement for Kyle Eastmond. But he was not able to help them get the fourth try that would have seen his side, who had lost their opening two Pool Four matches, gain a much-needed bonus point. In torrential rain and on a poor pitch, Ford's 11th-minute drop goal gave Bath a lead they would never lose, although they were helped by indiscipline from the hosts. A cowardly attack by Antoine Battut, who struck the back of Chris Cook's head with his forearm in an off-the-ball incident, saw the French flanker spend 10 minutes off the pitch, although he was lucky not to have been red carded. Thomas's try came with the French side down to 14 men and Bath again scored when Montpellier were a player short after captain Thibaut Privat was sent to the sin bin for taking Thomas out at a lineout. Within a minute, the hosts conceded a penalty try, which Ford converted to give Bath a 23-0 half-time lead. Montpellier, eighth in France's Top 14 and without a win in the Champions Cup, changed their front row at the break, but Bath increased their lead within 10 minutes of the restart. Leroy Houston dived over in the corner after Kyle Eastmond had burst through the home defence following an intelligent dummy from the excellent Ford and an offload from the impressive Thomas. Charles Geli, a half-time replacement, became the third Montpellier player to be sin-binned after only 11 minutes on the field, this time for hands in the ruck. But Bath could not capitalise on the man advantage before the hosts grabbed a consolation try through Tulou from a maul that the visitors failed to stop. However, a rare moment of ill-discipline from the English side saw second row Stuart Hooper end the game watching from the sidelines after a lineout infringement and Bath's remaining 14 men could not get the fourth try. The two sides will meet again in the Champions Cup on Friday, 12 December. Bath coach Mike Ford said: "I thought we were excellent in the first half, we built a score, got a couple of tries right before the break and we were on top. "I unleashed the bench after 50 minutes and I thought we had enough time to get that bonus point. We are unbelievably frustrated that the game turned so scrappy. "Of course we are disappointed as we needed a bonus point because of where we are in the pool, but hopefully Glasgow and Toulouse can take points off each other and we can get a win next week." Montpellier: Y Watremez, T Bianchin, P Cilliers, R Tchale-Watchou, T Privat (capt), A Battut, K Galletier, A Tulou, B Paillaugue, E Selponi, L Dupont, W Olivier, R Ranger, Y Artru, B Fall. Replacements: Sicard for Fall (61), Pelissie for Selponi (59), Iribaren for Paillaugue (71), Geli for T. Bianchin (41), Attoub for Cilliers (41), Donnelly for Privat (63), Ouedraogo for Battut (63). Sin bin: Battut (26), Privat (39), Geli (52). Bath: A Watson, H Agulla, J Joseph, K Eastmond, M Banahan, G Ford, C Cook, N Auterac, R Batty, H Thomas, S Hooper (capt), D Day, D Sisi, C Fearns, L Houston. Replacements: Burgess for Eastmond (53), James for Auterac (51), Webber for Batty (52), Wilson for Thomas (52), Attwood for Day (54). Not Used: Faosiliva, Stringer, Devoto.